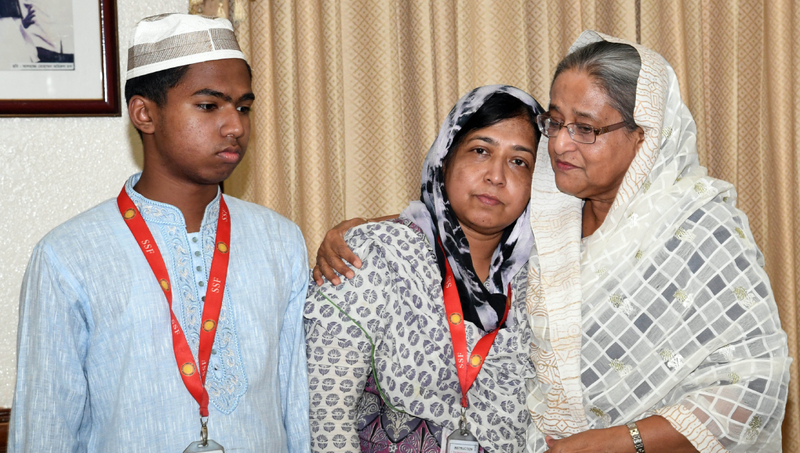 Dhaka, Mar 22 : Prime Minister Sheikh Hasina on Friday consoled the parents of private university student Abrar Ahmed Chowdhury, who was killed in a road accident on Tuesday, as they met her at her official residence Ganobhaban. Brig Gen (retd) Arif Ahmed Chowdhury and Farida Fatemi, the father and mother of Abrar, went to Ganobhaban around 8:15 pm and stayed there for nearly one hour,” PM’s Deputy Press Secretary Shakhawat Moon told that. The Prime Minister consoled Abrar’s parents and expressed deep shock and sorrow at the tragic death of their son, Moon said. She also prayed for the eternal peace of the departed soul. Mayor of Dhaka North City Corporation Atiqul Islam, PM’s Military Secretary Major General Mian Mohammad Zainul Abedin and Abrar’s brother was present on the occasion. Abrar, a first-year honours student of International Relations Department at Bangladesh University of Professionals (BUP), was killed after a bus of ‘Suprabhat Paribahan’ ran him over at Nodda near Bashundhara Residential area on Tuesday morning.